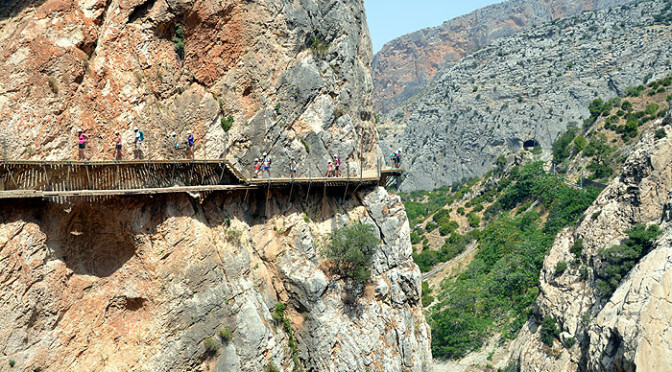 Looking at the official Caminito del Rey online reservation system we can see that October 2015 is now fully booked and there are just a few weekdays left for the months of November and December. Along with this, access is now only being granted from the Ardales/kings chair/reservoir side with no explanation or reason being given by the authorities running what is now one of the biggest tourist attractions for the area. I have written to and telephoned the Diputation of Malaga and they simply won’t tell me anything about these two points I am making here. Quite frankly I don’t understand the need for secrecy… The official website is totally lacking in any updated news when all it would take is a small announcement telling people of the changes. Comments welcome if anyone can find out what is really going on. Previous PostGALA DE CLAUSURA IV BIENAL DE ARTE FLAMENCO / Temporada 2015-16 / DANZA – Teatro Cervantes de MálagaNext PostThank you to everyone who has booked a hotel from this website.